NAR: The Trizec Building had been a controversial project. It was a very grand scheme, which captured the imagination of the city council. They were driven by the view that if they built this corner big that it would maintain it as the third largest city in the country. They decided to plunk into the middle of that famous corner the largest complex Winnipeg had ever seen. When you have an important corner, you have a historically interesting corner, is this the best we could have done. My answer is this is not the best we could have done. We could have designed it differently and had better city for it. The architecture of the Trizec building promised more than was realized. 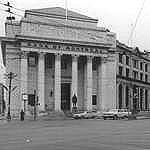 The Bank of Nova Scotia building we see today was originally a real jewel almost like a cut diamond. And it was going to shine on the corner of P&M and it doesn't do that. 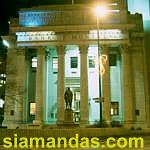 The grand dame is the Bank of Montreal. 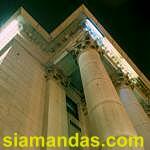 NAR: Indeed, the Bank of Montreal stands like a Roman Temple at the south east corner. Its marble façade glistening in the afternoon light. At night, gleaming like a timeless beacon at the crossroads of the city. The branch was designed by McKim Mead and White... the exterior is granite. We have six columns on the exterior. It's such a special experience when you come in the main doors: it's overwhelming. 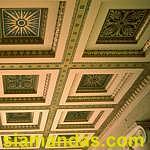 You walk into our main banking hall and we are the oldest banking hall still operating in Canada and you look up the ceiling and you look up at the walls and its so expansive and its so beautiful. The ceiling is gold leaf, very intricately designed ceiling. In 1980 we had it estimated at $1m. At the back of the building...is stain glass windows...you will see that they bear 3 coats of arms; they have the bank's, the province's they have our country's. 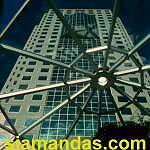 It's so difficult for me to put into words how it feels to be working at Winnipeg main Bank of Montreal. The premise outside in the evening, particularly in the later evening when its dusk and the lights. It makes your heart swell. And to be able to say to anyone; family and friends that I work at bank of Montreal at Portage and Main; it's such a privilege! NAR: The most recent corner to see change is the new Toronto Dominion Bank tower at the Northwest corner. It's just changed hands, coming into local ownership by the Asper family. 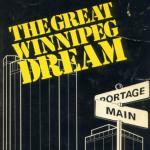 Our family is extremely rooted in the city of Winnipeg. When this building came up for sale we figured that it’s a great investment. But it's also really a symbol for us as far as we are concerned. It's the best office building in town. 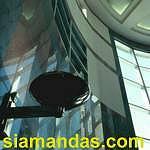 It's a 33 storey building with a beautiful rounded semicircular glass facade that goes all the way up the building. One of the great things about it is the plaza that was built out in front. And there is a skylight that brings natural light into the concourse. There's this huge open entranceway. It's 2 or 3 stories high and its all glass and it feels warm.